Cheyenne Hendricks, 16, holds onto a rabbit named “No No Bad Bunny” at the Retired Rabbit Sanctuary. Cheyenne and her parents run the sanctuary in Eastern Bexar County. Photo by Kin Man Hui, San Antonio Express-News. Here’s a great Easter story. 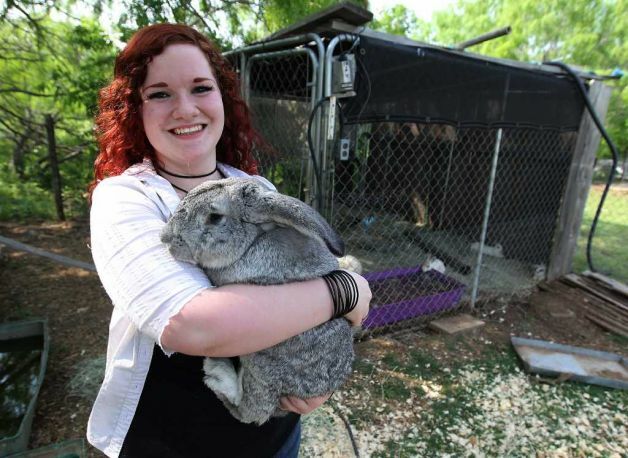 In far eastern Bexar County, Texas, 16-year-old Cheyenne Hendricks and her parents operate the Retired Rabbit Sanctuary, a refuge for unwanted rabbits. Other animals call the place home, but 78 rabbits are its primary residents. The animals most often were unwanted Easter gifts whose novelty wore off when the recipients realized that live rabbits aren’t stuffed toys. But, others were used as bait in hunting and dog-fighting and amazingly survived, albeit injured. Cheyenne, 16, spends five hours each day and weekends tending to the brood. If there’s a negative to the work, she said, it’s seeing the injuries that people have inflicted upon the animals. She supports city ordinances that forbid anyone to sell, lease, barter or rent rabbits, chicks or ducklings less than 8 weeks old as novelties or pets. They also make illegal the longtime practice of dyeing or tinting rabbits, ducklings or chicks as well as possessing animals that have been colored. Founded in 1998, the sanctuary takes in rabbits that have been abandoned, injured, dropped off at shelters or set loose in the wild, where they’re ill-equipped to survive the 8 to 12 years of a normal lifespan. It works with several rescue groups including the Animal Defense League of Texas and the Houston SPCA. The family uses their own money and donations to maintain the facility. They ask people who wish to surrender rabbits to donate a bag of rabbit food also. When the rabbits arrive, they’re quarantined for 14 days and segregated by gender, so they won’t reproduce. The sanctuary also provides educational seminars in conjunction with the San Antonio Humane Society, warning people about the dangers of giving pets as gifts, which often leads to abuse and neglect. Rabbit may be pests in the eyes of many, but like most animals, they definitely don’t deserve the maltreatment that’s often forced upon them by heartless fools. Visit the Retired Rabbit Sanctuary here: http://retiredrabbits.org/.